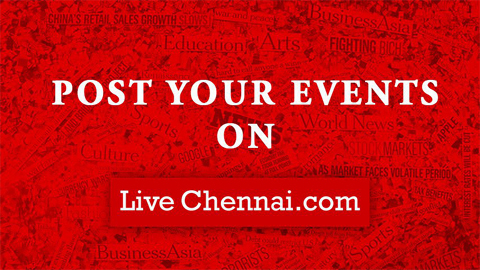 Live Chennai here unveils a remarkable opportunity to showcase and publicize your events and share invite calls to your audience from Chennai’s leading online portal. Any event, function, celebration, or felicitation event conducted at Universities, Corporate companies, Organizations, NGOs, or other bodies may get their event details, invitation, promotions, announcements and press releases published on LiveChennai.com. For this, we request the coordinators to send across a Requisition mail to admin@livechennai.com and our representatives shall get back to you at the earliest.